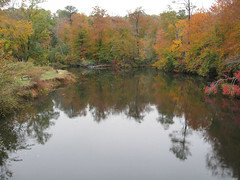 Cost: Variable – seasonal and Virginia resident rates. We paid about $29/night for 30 amp hookup and water. 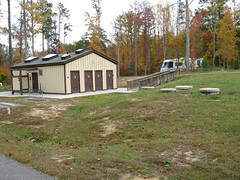 General/Facilities: PSP has a lot of facilities, including camping, boating, hiking, mountain biking, swimming, amphitheater, and general nature and park facilities. 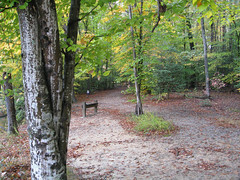 Camping: Facilities are fairly modern and nicely maintained. There are two camping areas right next to each other. 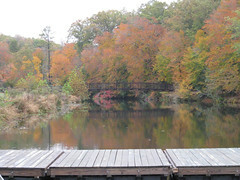 The “old” area and the “new” area are similar and both are in great shape. The main difference is that the old area is more wooded, but not as level and doesn’t have as much paved areas for parking your rig. 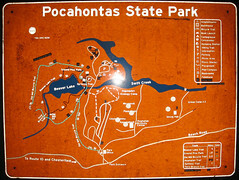 There is also tent camping, little cabins, group camping and “buddy” camping. 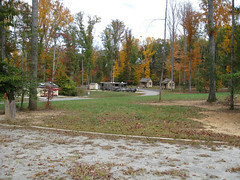 Buddy camp areas are where three sites share one entrance and they must be reserved as a group. There are toilets and showers, as well as simple camp stores and laundry facilities. All are in good repair and clean (although spiders and bugs are regular visitors to the showers, no matter how clean they are). All sites have fire rings and grills. There are pull-through, back in, tent and cabin sites. Critters: Surprisingly, there were no where near as many critters as we expected for a wooded park this size, but that may be due to our timing… Hunting season had just opened and much of the wildlife may have been in hiding. For much of our stay, we didn’t see much more than squirrells. We did a little exploring the last day and managed to spot several large (fat) groundhogs by the pool area, as well as a small group of deer. There are signs regarding osprey, but we didn’t see any. Gotchas: Everything is pretty much as advertised. 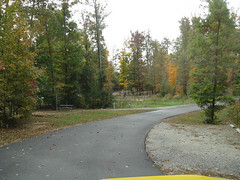 Camp hosts were friendly, staff was accommodating and everything was well maintained. You might want to check the website to see if there are any events going on. There was a cross-country race starting the day we left, but it didn’t impact our stay at all. Also, a lot of facilities are seasonal. 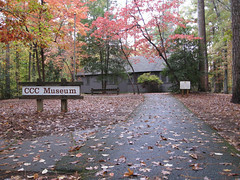 The pool, boathouse, CCC Museum, Nature Exhibit and Cultural Exhibits were all closed. Alcohol is allowed, but they request that there is no “open consumption”. I assume this means that you shouldn’t be chugging beers in the campground, but you’re fine in your RV or tent. There is a ban on bringing in firewood due to various critters that can infect the trees. We didn’t see any notices about collecting wood and several people were doing so. They also offer wood for sale. I think the cost was $5 for a half dozen pieces. We used charcoal for the grill, which we bought from the local grocery store a few miles up the street.